She stood regally in front of the room, wearing a bright purple blazer with a matching scarf draped around her ebony neck. It was the matter-of-fact way she told the story that stung. This was my first MLK community breakfast, one of many that take place across the country on the third Monday of January. I had pulled my two sons out of school to come, but I was nervous before we walked in. I didn’t know what to expect. This was new territory for me as a white person and as a mother. I wasn’t sure I belonged. Would I be welcomed, or was it a celebration for African Americans only? Pushing through that door, I’ve never been more warmly greeted. The atmosphere crackled with joy, there was laughter as people greeted each other, and someone boomed, “How ya doin’ this morning?” in a way that melted my fears. It was a great morning celebrating the power of nonviolence and continuing to build the dream of equality set forth by Dr. Martin Luther King Jr. What I didn’t realize that day was how profoundly this one morning would impact my kids. 1. We show our kids what’s important bywhere we show up. Children learn by doing. It’s what we do, not what we say, that tells our children what’s important. Take time to show up and celebrate how far our country has come in living out Dr. King’s Dream—and reflect on how far we still need to go. At that community breakfast, my kids saw all types of people taking time off work to unite around a shared vision—from city officials to pastors, activists, and families. Their presence sent a clear message that this event, and the vision behind it, is important to our community. That one lesson was far more valuable than whatever they missed in school that morning. 2. Children need to commemorate their country’s history. History is made of our collective stories. To know our history, we have to listen to each other’s stories then. Our families are ground zero for this work—for unmaking racism and building community. Every year, there are fewer people alive who can tell us first-hand accounts of the civil rights movement. Fewer people who can connect us to that reality. Listening to the women who spoke at that MLK breakfast—hearing her story of growing up during segregation—allowed me to wrap my heart and my head around that reality in a whole new way. As a white American, it was difficult to hear her story, but it galvanized me to start listening to minority voices and experiences, instead of assuming that I already knew their story or that it was similar to my own. 3. Our children need to know they are an important part of their communities. Meeting those who came before them and those who are different from them helps weave our children into the fabric of their community. That morning at the MLK breakfast, my sons got to experience the power of different groups actively caring for each other. They watched a local African American men’s group serve breakfast. They listened to women from the black and Native American communities give keynote speeches. But they not only got to watch, they got to build those relationships for themselves. There was a priest at the breakfast and, having never met a priest before, my sons had big questions about his outfit. He responded with a smile and questions of his own. Our children can’t look up to indigenous, black, female, or Muslim leaders if they haven’t ever met them. And they won’t know how to build relationships with those who are different if they never get the chance to do so while they’re young. This is how we build the Beloved Community that Dr. King began half a century ago. One question, one opportunity, one relationship at a time. 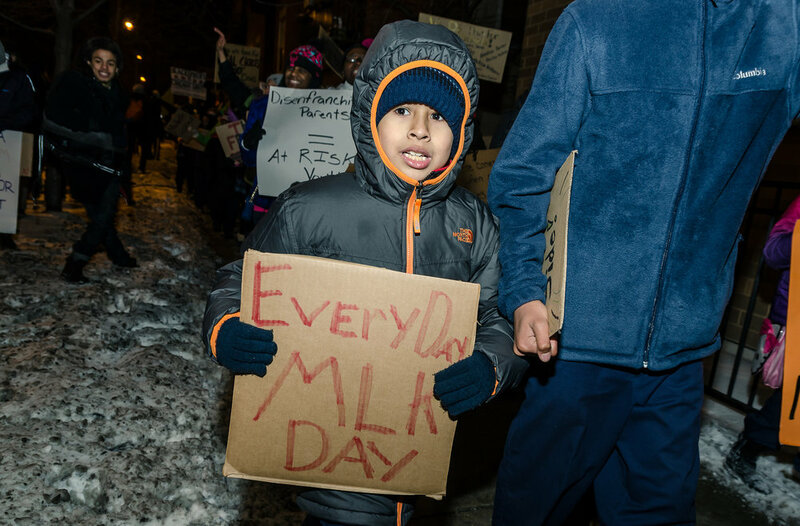 What will you show your children this Martin Luther King Jr. Day? How will you help them carry on the work of building the Beloved Community? Participating with my children showed me I didn’t have to have all the answers or know exactly how to talk about our country’s history—because I’m not living or parenting in a vacuum. I have a community filled with people whose stories are different from my own. Whose stories can teach my children a different way to see the world. All I have to do is have the courage to push open the door and meet them.